As the results were finalized, LeDuc's law of referenda—that voters increasingly favor the status quo as referendum campaigns wear on—had clearly failed to prevent Britain's dramatic exit from the European Union (EU). Despite apocalyptic warnings from those who supported the status quo, 51.9 percent of voters chose to endorse “Brexit.” Instant reactions presented the result as a shock, but Harold D. Clarke, Matthew Goodwin, and Paul Whiteley's book analyzing the factors that led up to this monumental decision makes it clear that a “leave” vote was far more likely than many expected. The book's most substantial contribution to the nascent Brexit literature is a series of models developed to analyze the factors behind voters’ support and opposition to the EU. The empirical evidence presented by the authors is wide-ranging and addresses the key issues leading up to the referendum: both direct and indirect attitudes toward the EU (Chapter 4), support for the United Kingdom Independence Party (Chapters 5 and 6), and the drivers of vote choice in the referendum itself (Chapter 7). Particularly noteworthy, Clarke, Goodwin, and Whiteley demonstrate that the immigration attitudes of members of the arch-Brexit United Kingdom Independence Party (UKIP) were not atypical of the British population. Using their own survey of UKIP members between 2014 and 2015, the authors demonstrate that the overall approval of ethnic minorities for UKIP members and the general public were very similar. Indeed, the UKIP's rise in support after 2010 was partly driven, the authors argue, by the party's dual focus on anti-EU and anti-immigration messages that tapped a pervasive concern with rising migration levels across Europe. More generally, the book places great emphasis on the long-run determinants of support for the EU, demonstrating how “the fundamentals of public opinion had been in place a long time ago” (p. 85). This empirical work is underpinned by a valence theory of voting: Clarke, Goodwin, and Whiteley argue that assessments of EU membership are contingent on how voters judge the EU's influence on key issues such as the economy and immigration. This claim, however, relies on voters using assessments of domestic outcomes to make judgments about the EU's performance. This mechanism is crucial to their theory, yet it is covered only briefly in the book. While their empirical work shows that valence issues do impact approval of EU membership, more attention could have been paid to how voters make valence assessments across levels of government. 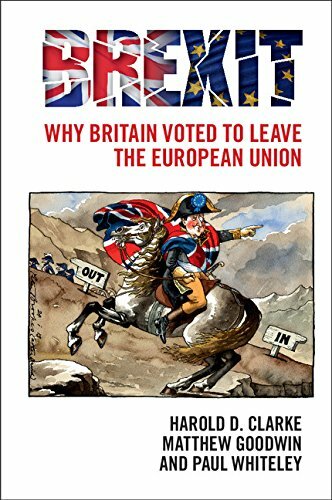 The authors’ answer to the book's subtitle, Why Britain Voted to Leave the European Union, is complex. Party and leadership cues, emotional appeals, and rational cost-benefit calculations all drove voters’ decisions on the referendum question. This complex argument forces the authors to directly engage with questions of endogeneity, to their credit. While perceptions of risk were influential, these, in turn, were driven by voters’ views of the economy and levels of immigration. For the “remain” campaign, the implication was damning: a strategy emphasizing the risks of leaving was ineffective among voters who felt threatened by immigration or the economy and public service provision. Clarke, Goodwin, and Whiteley's work is an important counterpoint to books such as Tim Shipman's All Out War: The Full Story of How Brexit Sank Britain's Political Class, shifting the reader's focus beyond the immediate context of the referendum campaign. This longer-term view of public opinion and its determinants is crucial to a full understanding of the Brexit decision, demonstrating how the tides of change were in the making far before the referendum campaign began.